By TLex An incredible watch and well worth a second look. 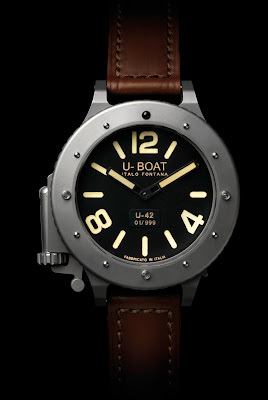 The U-42 is based on its colossal sibling, the 65mm U-1942. 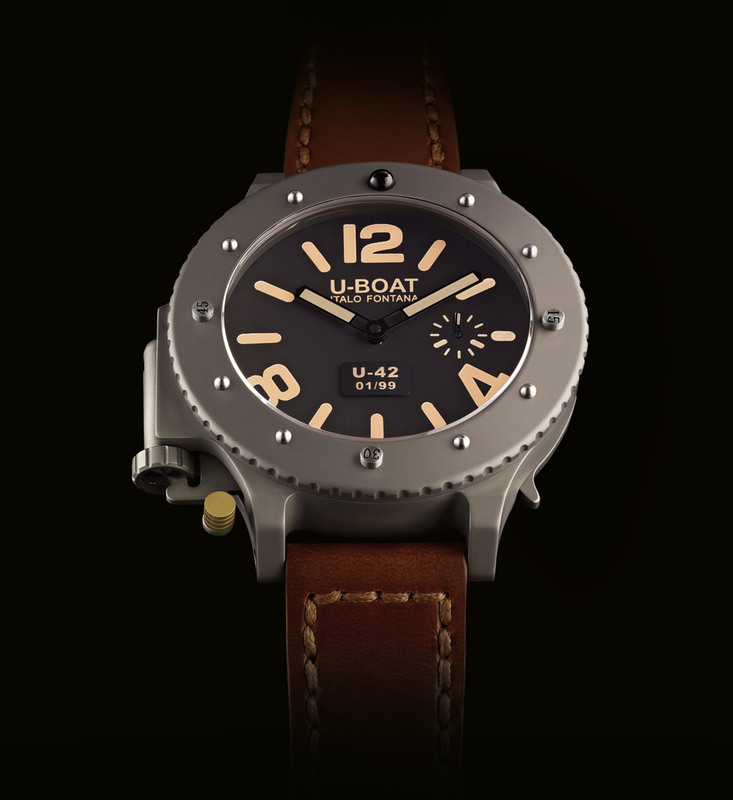 The U-42's Grade5 titanium case still measures an imposing 53mm x 18mm; a whopping 65mm with the crown. 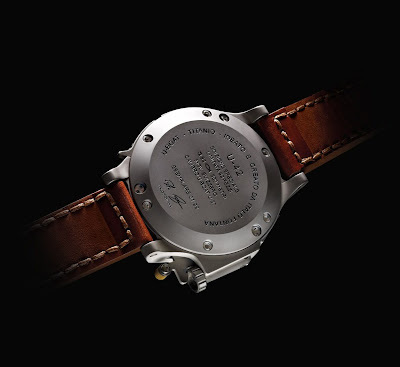 It has all the features that one might expect of a watch of its ilk; automatic movement, solid 300m water-resistance rating, massive scratch resistant sapphire crystal and a rotational divers bezel (bi-directional), which is lockable by means of a lever on the right side of its case. Its disproportionate and equally unusual winding crown has been built in two parts; the first is attached to the movement stem, whilst the other is hinged to it with a pivot giving a flexible joint configuration, allowing the crown to protrude considerably from the watch itself for easy winding and setting of the time, yet being able to return safely to a hidden position for a slightly sleeker appearance. Its case houses an automatic Swiss caliber, the U-BOAT U-28 with 25 jewels, 28,800 vph and a power reserve of 40 hours. Its special dial (available in either black or beige) is made from a single piece of galvanized brass, finished with a bright enamel coating. Its hands in German Silver and its beautiful strap handcrafted in sumptuous Italian leather, and finished with a Grade 5 titanium buckle. The U-42 is a Limited Edition of 999 pieces. There are also 99 pieces of the 'Edizione Speciale' pictured at the top of the post (dial) and the very bottom of the post (caseback). MOVEMENT Automatic movement, caliber U-64. Power reserve 46 hours. CASE Back case fixed on case with 6 encapsulated hexagon screws. Watertight on axis reset and assured charge by PTFE gasket Bi-directional rotating bezel lockable with a lever on the right side of the case. Fixing of revolving bezel by 3 screws encapsulated in the back case; the bezel removing, for maintenance and washing obtained by removing the three screws, does not affect the watch watertight. 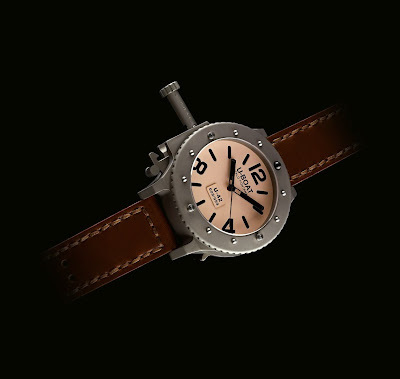 STRAP Brown leather handcrafted, width 23/23, and fitted with a titanium tongue buckle. Beautiful although not suited for diving as the 5min markers are not readable since not with luminova. 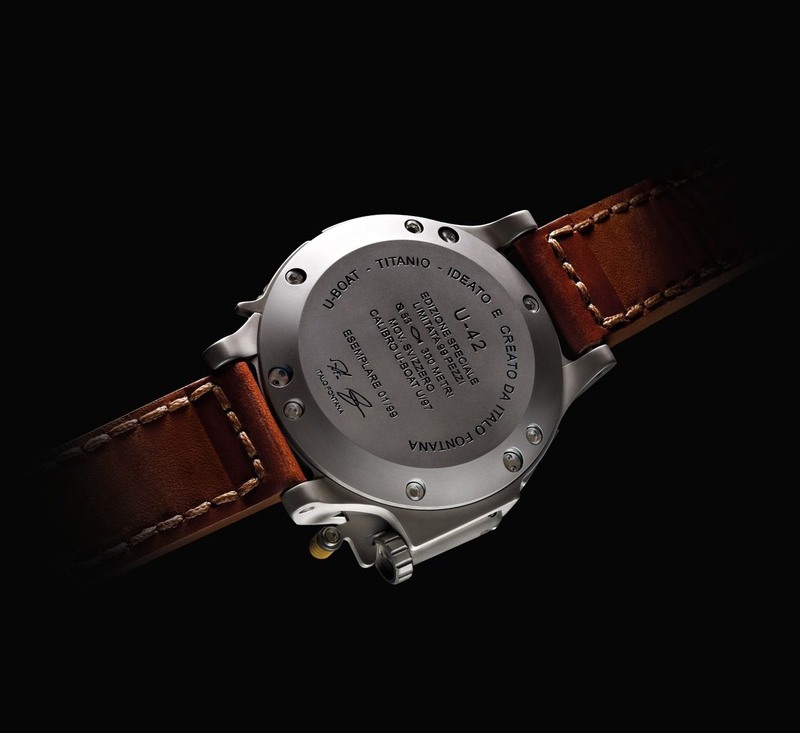 But who would use a Watch with a leather strap for diving anyway?